To commemorate the tenth anniversary of Rockman EXE/Mega Man Battle Network, I thought I'd share some neat little treasures of mine: images of the very first preview assets for Battle Network 1 -- press releases and such that hail from when the game was first announced! These papers reek of early '00 nostalgia; you might have seen some of them quite some time ago... I know I have. The first batch (below) yields from E3 2001 back when BN was first announced for release in North America.. 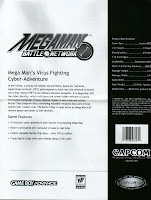 In addition to some nice pre-release screenshots looming in the background on the left page, the booklet also seems to indicate Capcom was once planning on retaining Lan's Japanese name, Netto, for localization. And hey, check out that slightly different abbreviation of PET: Personal Exploration Terminal. Sounds a tad more appealing than PErsonal Terminal, if you ask me. The right-most images a rare site, these days. 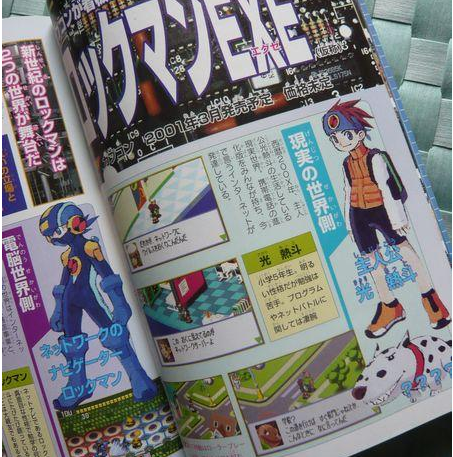 It was in an file sent out to the press a couple months before E3, shortly after EXE's release in Japan. The images suggests that Capcom once considered on naming the series in the U.S as Mega Man EXE as opposed to Battle Network, OR it's merely advertising the character MM.EXE himself, although the Roll variant seems to suggest otherwise. Feel free to speculate. 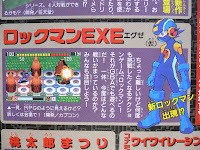 What you see here are the very first Japanese previews for Rockman EXE, which date back even further than E3 2001: fall, 2000. Keen eyed fans will note a few striking differences from the pre-release version of the game pictured in the above magazine scans. The leftmost scan features a handful of beta battlefield shots, including a small glimpse at an an early Custom screen. Also of note, a slightly alternate mugshot of Enzan (Chaud) is present on the right page. The Middle scan houses one of the more popular beta screenshots, which features the ever-peculiar "A/B" gauge at the bottom of the screen. Finally, the right-most scan... is that concept art of Gow? Why, I believe it is! 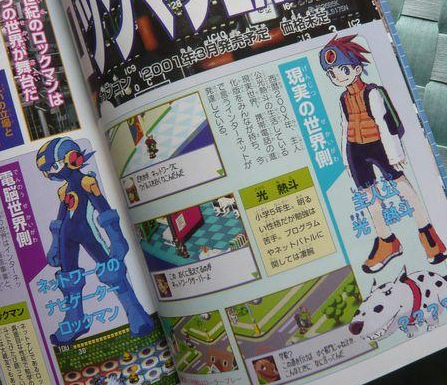 Perhaps he was originally planned to appear as early as BN1? I've very fond memories of that middle scan, in particular. IIRC, that was the first time I ever laid eyes upon Rockman.EXE... and I hated it. Colorful, yes, but there was something about his posture -- his lankiness or something, that really irked me initially. Of course, I grew to love the design; it was different than anything we've ever seen before from the franchise, and for that I admired it. I'm kicking myself for this one, but since my recent hard drive crash, I'm unable to restore this neat video presentation from E3 2001 which has Keiji Inafune talking about MMBN. Lot of nice beta stuff in there, too. If I can find a backup of it somewhere, I'll be sure to share it! Yes, even in the beginning, the US logo was tacky. Are there any sites where this sort of information first appeared? 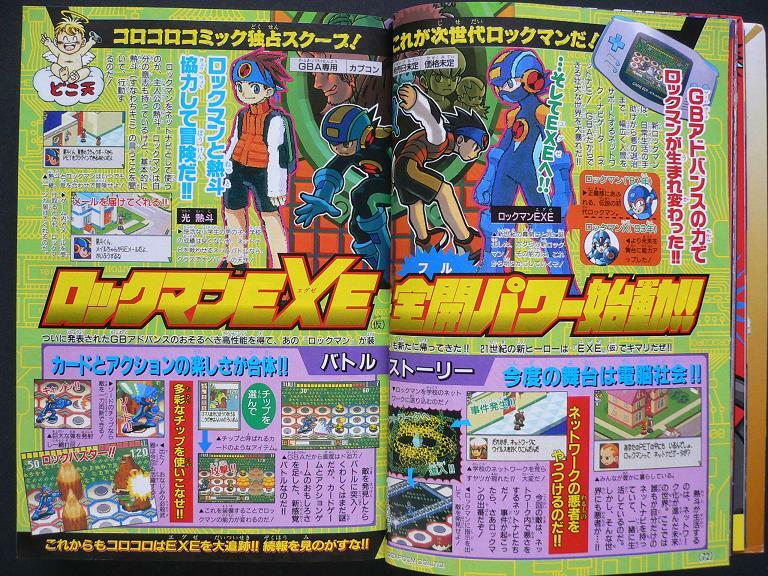 hey, that image on the right seems to be using the Mega Man Legends font. I am calling the police right now. Eh, I don't blame you, Protodude. That stance is horribly awkward in more ways than one. First time I've ever seen that artwork, unless I've actually seen it before and my mind wants to repress it (which is somewhat likely, actually). The logo I remembered appeared specifically on IGN between 2000 and 2001. As for everything else, I've got nothing. Nice scans. :) And yeah, Personal Exploration Terminal sounds a bit better, given the nature of the Net. 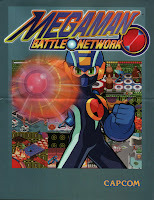 That goes to show you, MegaMan.EXE will always be the main hing next o Classic MegaMan. 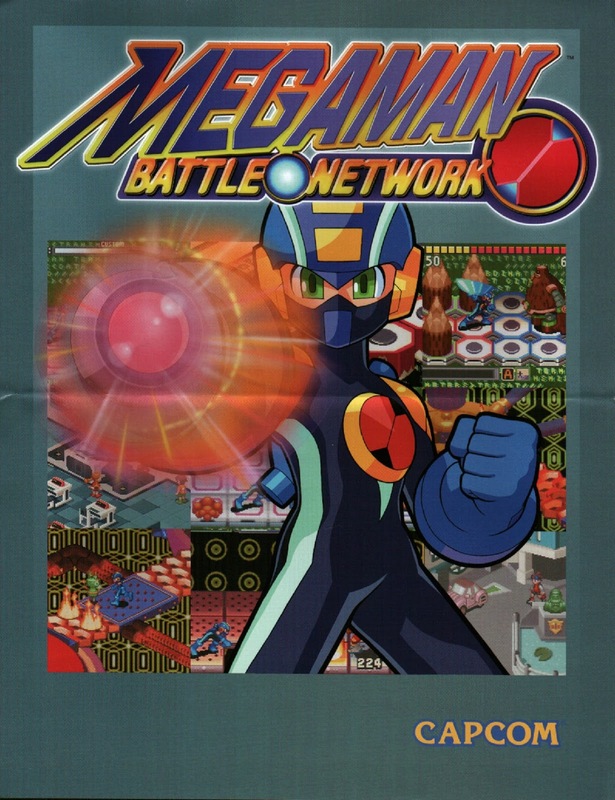 MegaMan.EXE is still everyone's favorite Cyber Blue Bomber and he was the mascot for MegaMan Anniversiy events. Kudos to you, MegaMan.EXE! I remember that first image. Man, it was so long ago. I remember the spread they had in Nintendo Power with a picture of Fireman and the internet. @ZeroX_Syaoran: (Difficult name to remember how to spell XD) The team that made Legends made MMBN. It's like being hit with a wave of nostalgia. 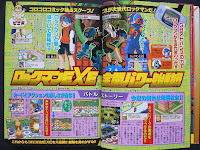 I vaguely remember these scans a few years back. I just wish that the gameplay had remained somewhat old school. The chips and stuff where cool, but why the weird perspective and all of the rpg elements? Those where uneccessary IMO. If it had been a faster paced sidescroller with the chip collecting and chip distribution system intact, I think that would have made for some interesting gameplay. Yes I played the gamecube game, and it was interesting, but very slow paced. My version would be more like almost metroid other m fast. It could have also been a tad more mature(just a tad!) and I would have loved the series! As it stands, I just can't play it, I have tried many many times. It would rock to get to see that version in action. I think the BN series had been an idea that they had for a while. Just look at data chips you get in Super Adventure Rockman. Battle chips look like them. 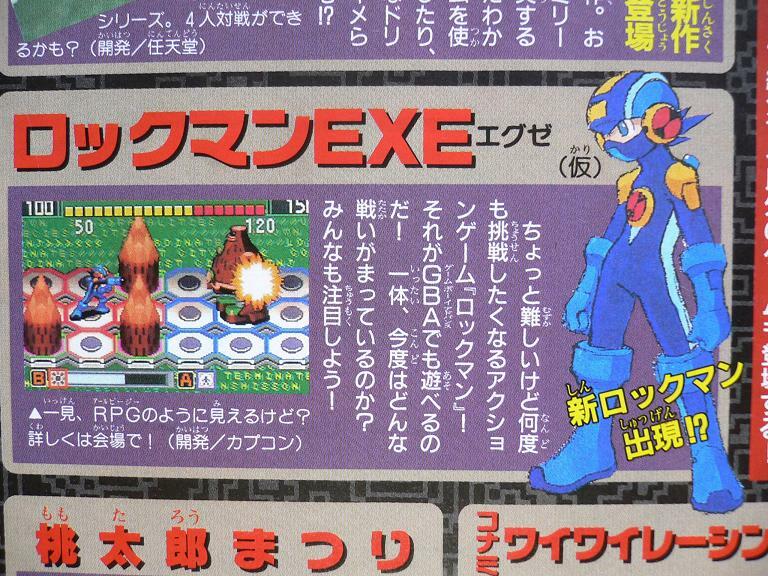 Also, the Navi system in Rockman Complete Works must have had some influence to the BN series. And the graphic on the Mode Select screen reminds me of a PET. @Turianx9: Though I loved the EXE series as it was for it's new gameplay, I wouldn't be opposed to trying the theoretical game you've proposed! I'd like to see them rethink the series for the 3DS. Keep the roots, but go crazy with awesomeness. Make the cyberworld more like the anime maybe? Something else? Personal Exploration Terminal just sounds like masturbation to me.